AMSOIL, the leader in synthetic lubrication, produced the world’s first API-qualified synthetic motor oil in 1972. 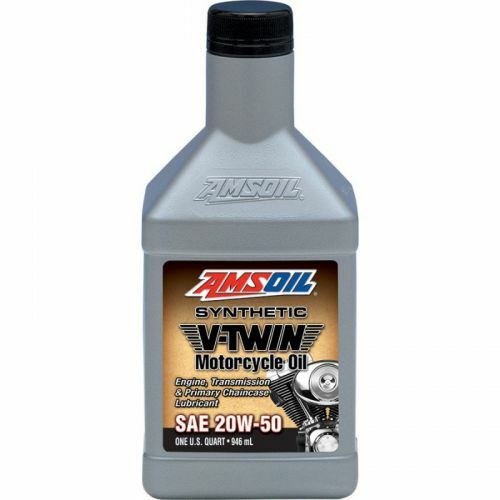 AMSOIL 20W-50 Synthetic V-Twin Motorcycle Oil is a premium oil designed for those who demand the absolute best lubrication for their motorcycles. It is the result of extensive research and is specially formulated to excel in all areas unique to motorcycles, including the high temperatures of air-cooled engines such as Harley-Davidson* V-twins, wet-clutch lubrication, extreme-pressure regions of gears and chains and rust common to short trips and storage. AMSOIL Synthetic V-Twin Motorcycle Oil is multi-functional and fulfills the requirements of both domestic and foreign motorcycles. Trust the extensive experience of AMSOIL, The First in Synthetics,® to do the best job protecting your motorcycle.